Items have always had a donor (Offered by), but now we can add members as co-donors for an item. This encourages multiple couples or other groups of members to collaborate on events or services. It also helps reduce questions you get from members who don't understand why these items aren't on their statement. The location (address) where the event will happen comes from the donor, so a member wants to hold an event at the church, you can move it to be offered by 'the church', and then add the original donor as a co-donor. (Memebers can assign co-donors, but they can't move items themselves, so they need to ask for your help to do that.) The item will then appear on both the church's statement and the co-donor, but now the address links on it's reminder email and the address on buyers statements will show the address of the church instead of the co-donor. You may select as many co-donors as you like by clicking in the Co-Donor input field as shown above. You can remove co-donors using the X in front of each name. You can't select the current donor as a co-donor, and each co-donor can only appear at most once per item. The screen shot above shows a 'normal' user logged in, but when you are logged in as admin, that first Offered By becomes a selectable list, so if you change it to another member, the item will go to that other member's statement. To move ALL items donated by a member at once, use the Move link on the statement page. There's several new options to help you move activity away from those long 'fake' composite member names back to the donor who is hosting the event, with co-donors. On each donor and co-donor statements, items with co-donors appear with a slightly different background shade with a pop-up showing the donor and co-donors. Any participating member may edit these items (including add/remove oneself as co-donors). The Email all link now includes the donor and co-donor emails with the other guests too. The automatic reminder emails for events are also sent to co-donors too. I made some unrelated changes to improve word-wrapping on long member names so statements should print a little nicer now too on both single-statement and bulk-statement views. 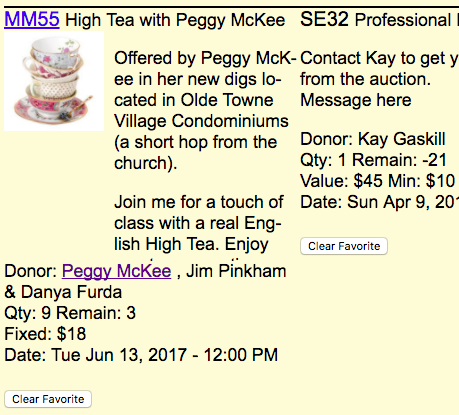 When you place an online bid, the message at the top includes co-donors (if any), for example: You are placing a bid on MM55 High Tea with Peggy McKee offered by Peggy McKee, and Jim Pinkham & Danya Furda. Bid sheets show co-donors, if any, with the donor listed first. Item Spreadsheet The donor column is now donors. Main donor is listed first, followed by co-donor names. Item Donor Report The donor and phone columns include each item's co-donors. Prior Donors Being an item donor or co-donor count equally in the totals. Bulk Statements Added ability to hide purchases or donations. Otherwise consistent with statement changes as noted above. Member Contact Info Labels Activity will include items which members either donate or co-donate. Sold Physical Items No changes - even though there is a donor column, this report just shows the primary donor name since physical items would not be likely to have co-donors. Sale Detail Donor columns shows co-donors. Unsold Items Donor columns shows co-donors.